We are glad to hear that you are satisfied with your finished product and that we were able to help. Enjoy the new look and feel of your home! I had my entire house done with Empire today. The sales rep was very nice. The wood guys downstairs were awesome.The carpet people on the other hand didn't call before the came, showed up late, and when the did show up, they did with a half crew, so it took twice as long as predicted. After the install I had a problem with an area that I had specifically asked them about.The previous people that owned the house had cats. I asked the sales Rep if I should treat it prior to them coming. He told me no that the carpet guys would deal with it when the time comes. If it needs anything they would let me know. Well they didn't. The base boards were so swollen that to get rid of some of the smell we replaced them. So now there is a gap between the carpet and the new non-smelling base board. I called the company to get a piece of carpet to fix it. ( the guys didn't leave any) The people at the office were not helpful at all. They didn't try to resolve my issue. 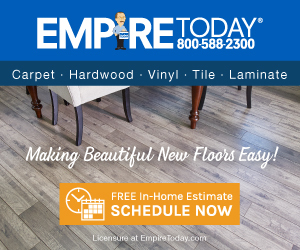 They would not give me a tine sample of carpet to fix the hole that was left by their mistake.I will never use Empire again.It is a shame that problem resolution is such an absent skill in a customer service company. Preferred solution: A piece of the carpet so i can fix it myself since the are unwilling and unable. half inch by 10 inches. Review #874168 is a subjective opinion of User874168. We understand your frustration and would like to follow up with you to discuss your experience in more detail. Unfortunately, we cannot locate your account with the information posted here. Please send your contact information to customersupport@empire-today.com so that we can follow up with you.